A question for devs-why not make jit run faster then gpu thread ( allow VPS>FPS ) ? Usually FPS and VPS in dolphin is synchronized, its either 60/60 or for example 30/60 when game is running fullspeed. If pc where dolphin is run is not able to run the game at fullspeed,fps will drop together,for example it will be 55 FPS and 55 VPS. So I was wondering why not atleast make it an option to leave VPS at 60 even though fps is lower ? Basically desync cpu emulator engine from the rest of dolphin threads ? It might sound like a bad idea,one would assume it would mess things up in emulation,and that jit needs to be sync to the rest of threads for dolphin to work correctly. However,based on my testing,this is not correct. There are some options currently in dolphin which will do what I am suggesting by accident,its not their intended behaviour. For example,vbeam or disabling idle skipping. I have tested a lot of games,and didnt see any emulation problem. Only effect desyncing cpu engine has is that LLE sound don't stutter when FPS goes below fullspeed. However,these option are "hacky" and dont always work. Maybe if options were added to desync the jit or jitil,it would work better ? BTW can anyone tell me is there any way to post this,ask about this,suggest this on google code dolphin page ? Because this is more suggestion then "issue"
Quote: So I was wondering why not atleast make it an option to leave VPS at 60 even though fps is lower ? Because that's not how most games are coded. If dolphin emulates the GPU out of sync with the CPU, every game would black screen on boot. (11-11-2012, 02:49 PM)skid Wrote: If dolphin emulates the GPU out of sync with the CPU, every game would black screen on boot. How do you explain this then ? Its screenshoot of SMG2 running with "vbeam trick"
I purposely slowed down gpu thread by using 3xIr with 4xSSAA. Fps is 34,while Vps is 111. Does this mean dolphin emulates the gpu out of sync with the cpu or not? Or does it mean fps/vps counter is broken ? (11-11-2012, 08:31 PM)rpglord Wrote: Does this mean dolphin emulates the gpu out of sync with the cpu or not? The GPU is not out of sync. The VBeam option does not make the GPU out of sync. If the GPU were out of sync, you'd get a black screen. The counter is not broken. 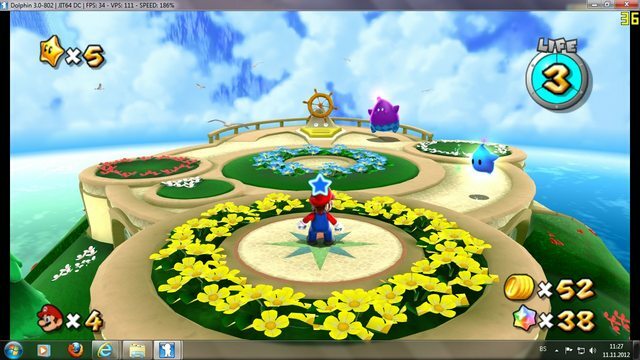 The game contains sync code that compensates for a slower graphics update. I'm not sure I understand your point correctly, but whatever. VPS is the amount of frame render requests sent by the CPU per (host) second. FPS is the amount of frames actually processed by the GPU per (host) second. VPS < FPS would mean the GPU processes more frames than request. Where should these frames come from, though? You can't just magically create data from nowhere. Dunno if that kinda answered your question, your point seemed like you wanted to have sth like the third case. EDIT: To elaborate a bit more on the second case: Like skid said, the game code takes care of this case and what most console games end up doing is "slow-motion". It would technically be possible to make the game logic dependent on the frame rate, but console games usually run at full FPS anyway so they're hardcoded for a fixed frame rate. So we have example 1 where VPS=FPS and example 2 where VPS>FPS. Issue I am desribing is that we can have both of these examples on exactly same hardware in exactly same game in exactly same place. Only thing which decides if it will be VPS=FPS or VPS>FPS is dolphin options idle skipping and vbeam, fact if gpu can keep up or not with number of frame render request sent by cpu doesn't seem to make any difference. Or in other words,were I to disable vbeam and/or enable idle skiping, in that scene in SMG2 I already posted screenshoot of,I would get 34 FPS AND 34 VPS INSTEAD of 111 VPS ! This is the issue I am talking here...it still seems VPS is SLOWED DOWN somehow with default dolphin options..
Quote: Issue I am desribing is that we can have both of these examples on exactly same hardware in exactly same game in exactly same place. But not the same settings. Incorrect. I have seen VPS > FPS happen with the default settings. 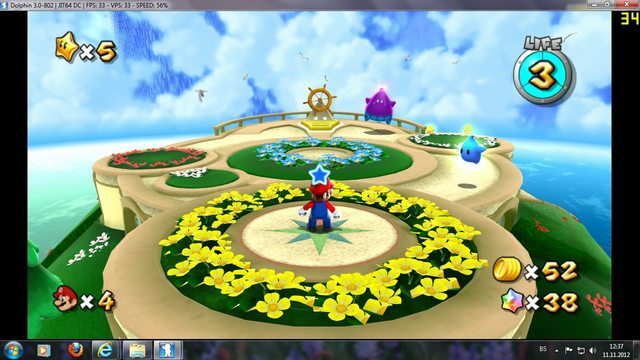 Quote: Or in other words,were I to disable vbeam and/or enable idle skiping, in that scene in SMG2 I already posted screenshoot of,I would get 34 FPS AND 34 VPS INSTEAD of 111 VPS ! (11-12-2012, 09:00 AM)NaturalViolence Wrote: Incorrect. I have seen VPS > FPS happen with the default settings. Usually it will only happen if game is coded to have lower fps. For example,we all know that not all games run at 60 fps.A lot of games runs at 30 fps. In that case, it will be 30 FPS / 60 VPS if computer is able to run the game at fullspeed. But its fixed ratio of 1:2,game is programmed to run that way. Basically letting the game code take care of sync issues intead forcibly slowing down jit/jitil recomplier. Lets take my example where VPS>FPS by game design.